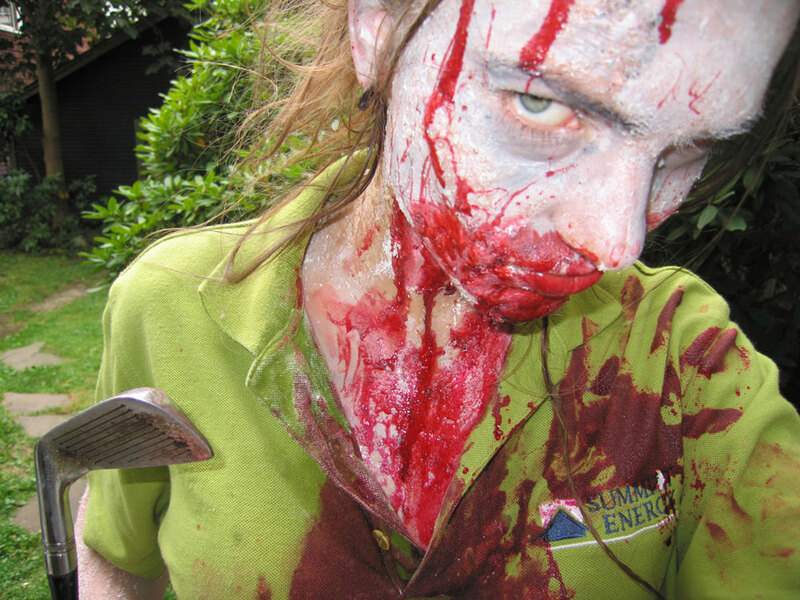 Last Saturday—August 25—was the third annual Vancouver Zombie Walk. With slightly less structure and moderately less drunkenness than Minneapolis’ Zombie Pub Crawl, the VZW proved a worthy surrogate and sensible opportunity to get my zombie on with fellow fans of kitsch, horror, mayhem, hilarity, look-at-me and strange gatherings of strangers doing strange things. Hooray! As I took some self portraits before freaking out a bus downtown, I noticed my battery light flashing, and thus didn’t bring my camera along to get any shots of the crowd. ‘Twas a pity, but I was ambivalent about bringing it anyway; it would’ve gotten in the way, gotten bloody, maybe dropped, as well as interfered with my costume. 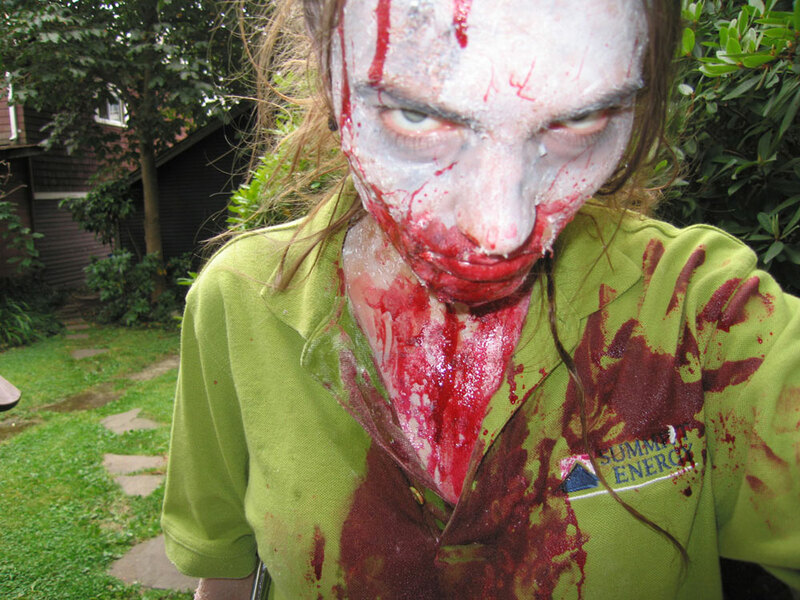 I wanted to be part of the horde, not part of the part that moves in for the money shot and suspends the disbelief. 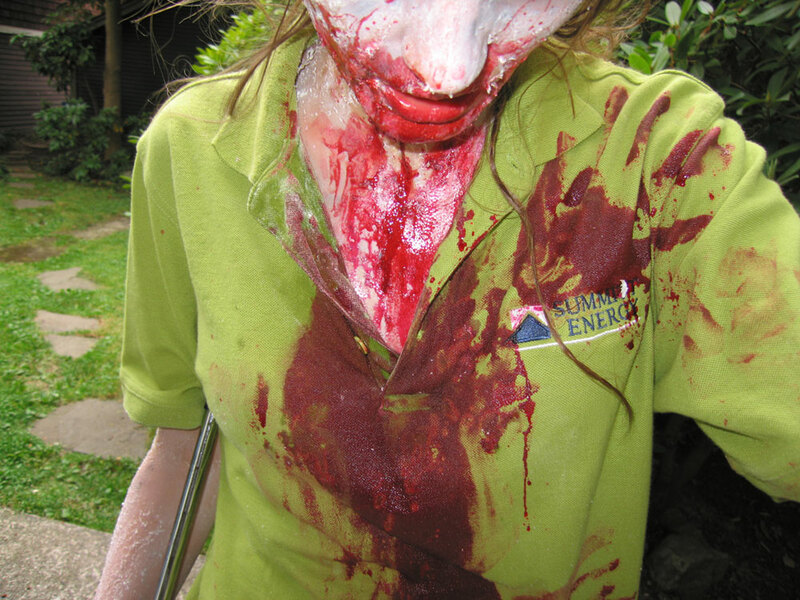 The face blood was store-bought theatrical, while the shirt gore was a corn syrup and food coloring concoction that turned out too fuchsia for my skin but was acceptable on fabric. 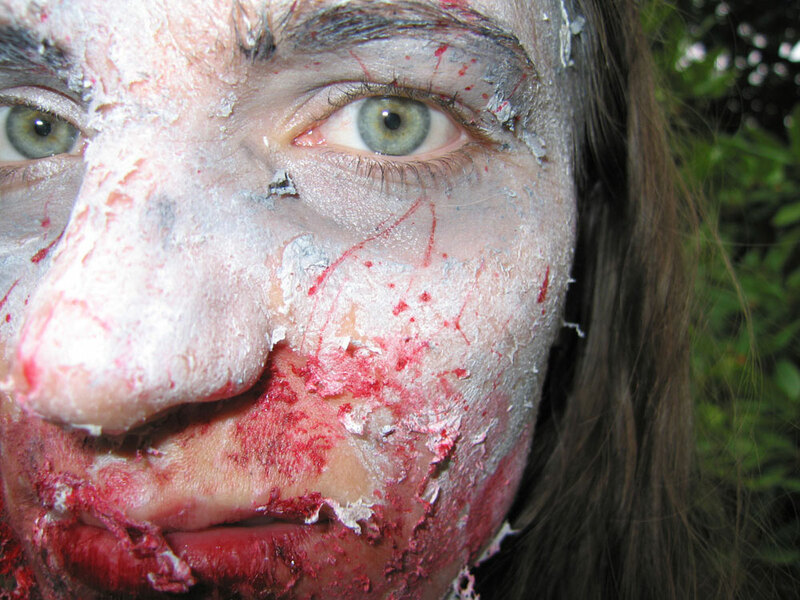 I created the rotting flesh with gelatin (letting it dry then peel and tear) with added two-dollar clown base makeup over the top. 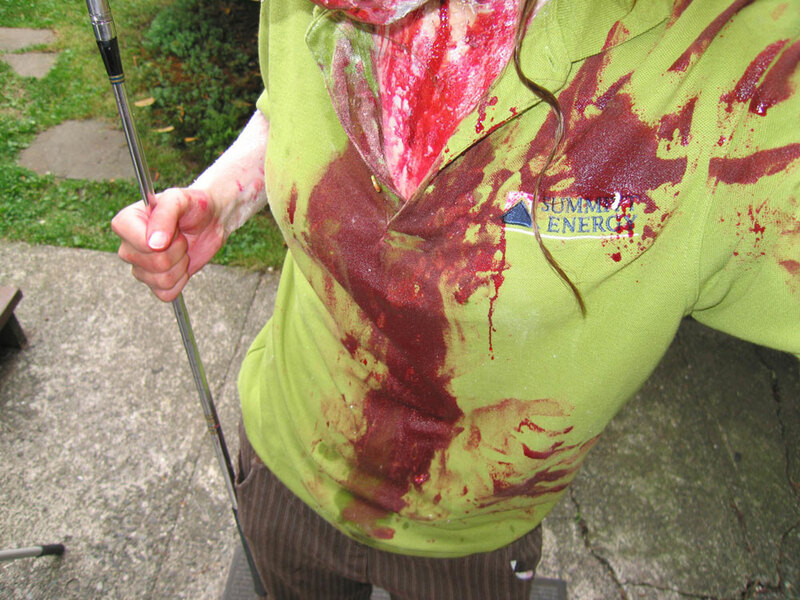 I went as a Golfer Zombie, complete with polo, stripey short pants, striped socks and a thrift store seven iron that I dragged all over town. The production was cheap and delightfully effective. The revenant revelers met downtown in front of the Vancouver Art Gallery and proceeded down Robson, up Denman, then back up Davie, blocking traffic slamming against busses and groaning for delicious brains. We ended back at the art gallery for a partial group portrait on the steps (can ya find me?). The response of typical passers-by, if they weren’t pissed-off power shoppers or terrorized tourists, was, “What’s this all about?” The answer was simple: Brains. But the processing of this, our most natural reply, wasn’t. What film school are you with? Who organized this? What are you doing? We are doing what we are doing. We are lurching, we are moaning, we are coughing blood on fancy cars. Action and imperative, one and the same. 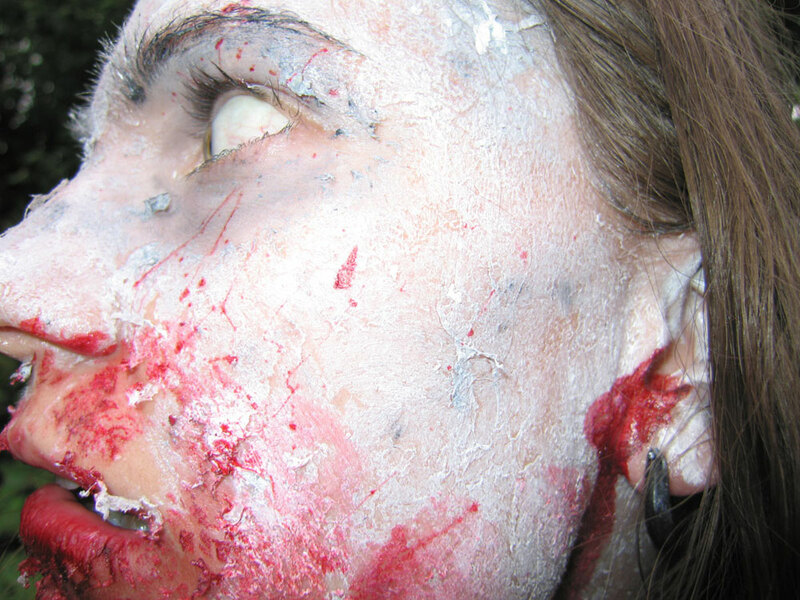 Best was stumbling through the fragrance and cosmetics wing of Sears, pausing to stare in the hundreds of reflective surfaces poised to point out blemishes (severed limbs, facial gashes, bitewounds throat wide) with the remedies quick at hand: real makeup, for pretty people. 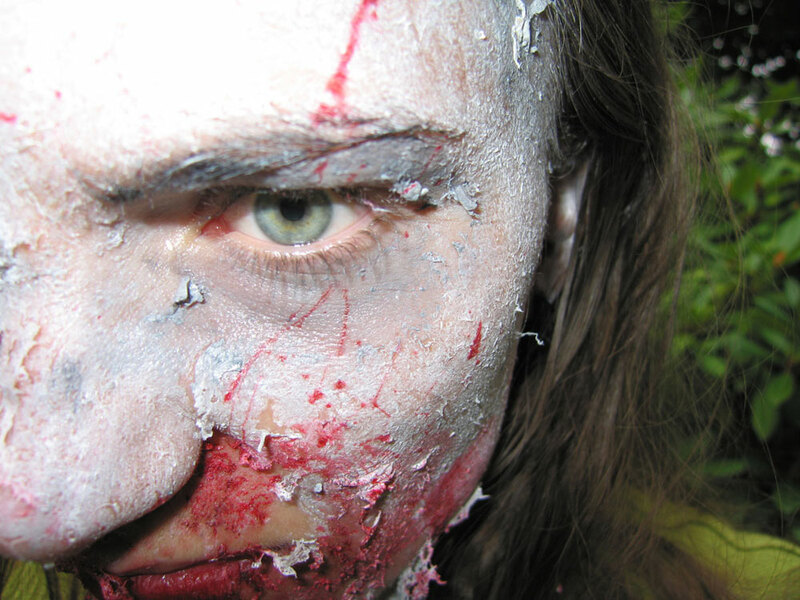 Beauticians stood cross-armed stiff, guarding mirrors and makeup chairs, pursing their lips into tight little Touch Me And I’ll Scream smiles of professional endurance and indignation as hundreds of bleeding rotting weaving zombies filed forth, sneering. Howling. Swaying to the soothing vapid music of the shopping maul. 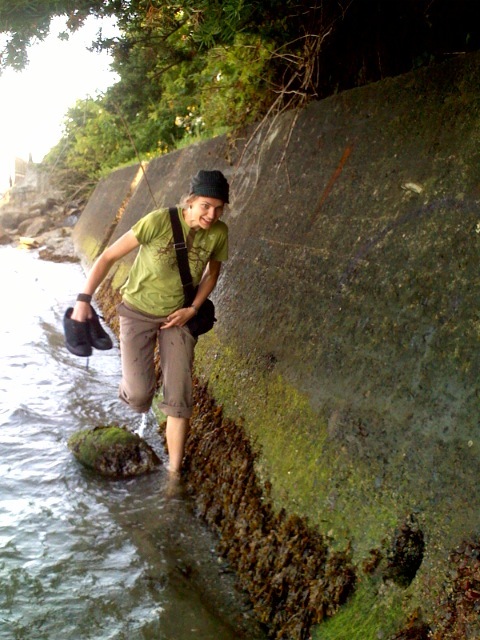 Here’s some flickr shots of me, and one of the better videos to get a sense of the insanity. Also of note and interest: the large amount of multimedia recording by innumerable people on the street who had no idea this event would occur. Cell phone cameras were the most prominent, of course, but I was surprised by the dozens into hundreds of actual cameras and camcorders that popped out of pockets, purses and backpacks—people on the sidewalks, in their cars, rushing out of restaurants to capture the chaos. Granted, we were in an affluent part of town, and Vancouver’s got a bit of a Hollywood complex—everyone’s a celebrity and filmmaker, the audience and the eye. I normally carry a camera everywhere myself—you never know what will happen, what interesting, breathtaking thing you might see. But I’d never seen it in practice en masse, citizen journalism in action of any kind, the impromptu and several-times-over simultaneous recording of the present moment. It was undoubtedly neat but also displacing… is not the word I want but the feeling I got. The intrepid everyman and -woman clutching digital devices weren’t watching the crowd, they were watching the real-time playback screens, reality through the viewfinder, projecting us into a private space instead of participating or merely being where we all were, here and now. They seemed more concerned with mentally blogging and vlogging and facebooking their wow totally crazy day while it was still happening right in front of them. 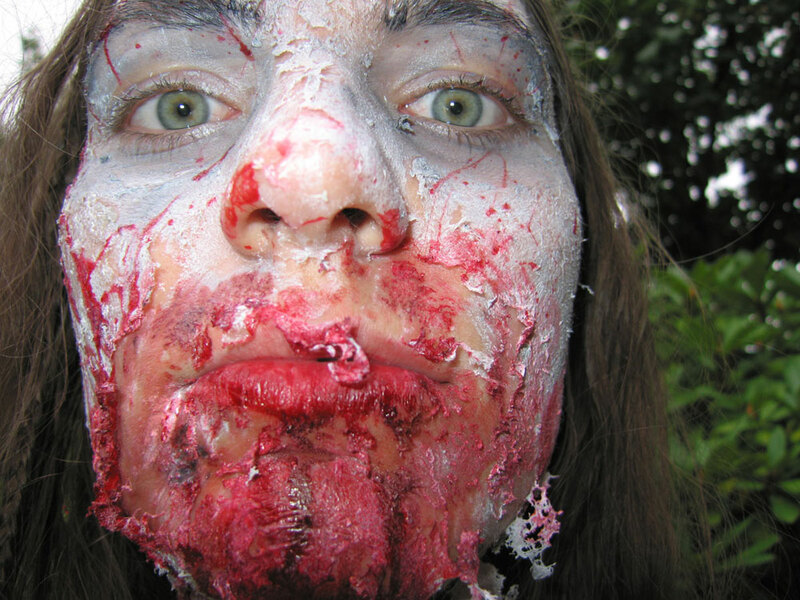 There was little room for interaction, and sure, all of us zombies, we were performing to be seen, to be unexpected and outrageous and ridiculous—and recorded. But after walking block upon block of sidewalk-packed people with eighty percent of them mediating us through a lens, making memories with cameras instead of their braaaaaaaains, something felt lost. 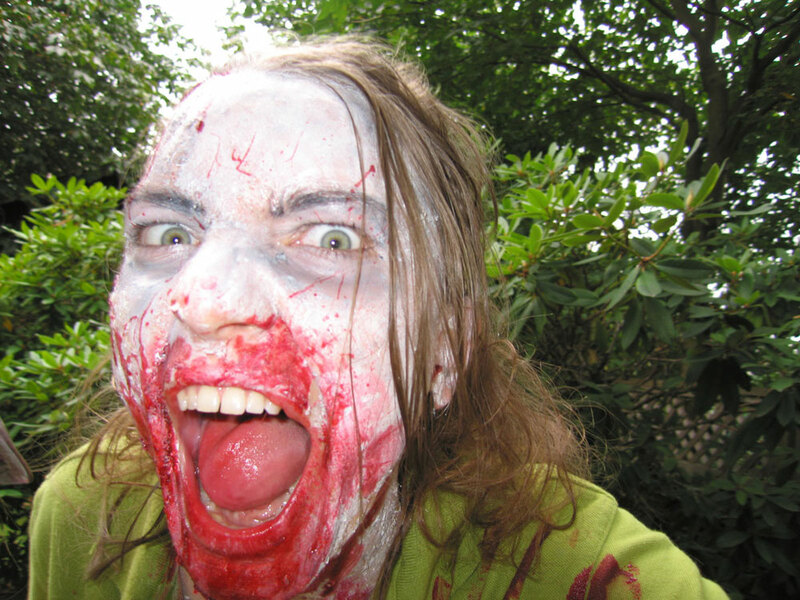 The Vancouver Zombie Walk is documented by thousands in thousands of ways, cell shots and shaky cams and audio clips of moans and screams. But it’s not remembered. It wasn’t lived. No wonder the mindless undead are so cogent these days. In related news, school starts after Labour Day, and I will shortly turn into a real zombie with a sure-to-be punishing schedule. I’m looking forward to it. The summer’s been grand and more, splendid unforgettable, the finishing touch on a full year since having moved to Canada. It’s been a tremendous last several months, and I look forward to more: engaging studies and knockout revelries, revelations and elations and letdowns, too. Given the rigors of work and study, I anticipate deepsicks lying fallow for awhile, which I regret but can’t help. But we’ll see. I steal time when I want to. I am not responsible for all of my perceptions, but I am always accountable for my reactions. Remind me, when I’m feeling low, strung-out strained. Hold me to my happiness. 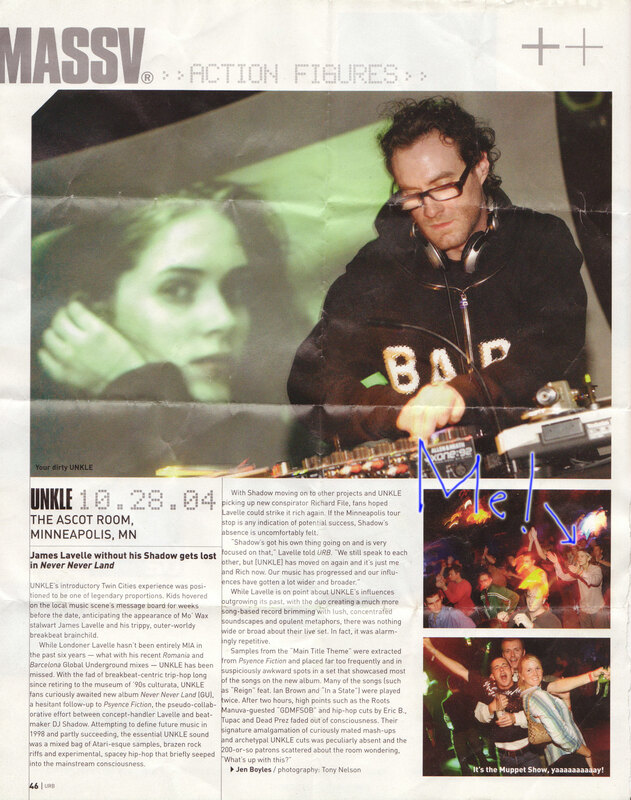 October 28, 2004, I saw Unkle perform at the Ascot Room in Minneapolis. Though DJ Shadow’s presence was sorely missed, it was a decent, fun show. Little did I know, I turned up in a crowd shot in URB magazine not long after. Big thanks to Frank for clipping and keeping the article for so long of ever. I’ll return it someday, I promise. hi. youre, not surprisingly, still doing and being awesome. kudos!